Have you ever had one of those moments where God speaks a word to you and it becomes an epiphany to you that changes your entire outlook? I had one of those moments. Of all things, it happened two minutes before I was to speak at my brother’s memorial service. It was such a powerful insight and has brought much comfort and a sense of peace to us as we mourn Matt’s passing. I was reminded of how my brother was a runner. He ran cross country in high school as well as a few marathons. I remembered the words of Paul in 2 Timothy 4. He had run his race and finished his course. Suddenly, a flash of insight hit me! My brother, who was the runner in the family, was also the first one of our immediate family to finish his earthly race! How fitting that was! Yes, we would still miss him immensely, but what a comfort this realization gave us! I have had an immense sense of peace since that epiphany. Whereas, prior to that moment, I would sob nearly every day, I no longer do that. Yes, I still cry, but not the heart-wrenching sobs of a heart that is breaking. Deep within my spirit, I know Matt is EXACTLY where Matt is supposed to be. That has helped me tremendously. What kind of race am I running? How do I want to be remembered when my earthly race is over? What kind of changes do I need to make to get my priorities in better order? One thing that was an immediate change is that when I visit my parents, I no longer leave without giving hugs and saying, “I love you.” That has become incredibly important to me. It is also important to me to check in on them even more than I did previously, for losing a child is something none of us can fully understand unless we’ve gone through that experience ourselves. I’m also giving a lot more hugs to extended family members and friends. The power of touch is huge, and the touch of a hug can help to heal broken hearts. While I frequently speak of my job and often say, “I love my job,” I don’t want that to be the first thing said of me. Rather, I want to be remembered for loving my God first and foremost, then for loving my family and friends. What kind of race are you running? Do you need to make changes? After the initial shock of hearing my brother died of a massive heart attack in March, I knew the Lord had given me a message to share at his memorial service. Having a mission in my pain certainly made those days of such intense grief a bit easier because the message He gave me about his mercy was something I was living out firsthand. I work the switchboard at a local hospital. It is very busy since I answer every call that comes to the switchboard from inside the hospital, outside the hospital, as well as those for the after-hours answering service for over one hundred doctors. It requires a lot of focus, multi-tasking, and people skills. Yet, every day, in spite of the excruciating ache in my heart, I was able to come to work, put on my happy face, and do my job. Granted, I would sob all the way home, but at least I was able to hold myself together while I was on the clock. That was nothing but God’s mercy carrying me. Through this, I felt the prayers of others like never before. After a grueling day at work, having been on the phone all day, I would come home and have to spend the evening on the phone, updating people on what was going on. Not only were we dealing with my brother’s death, but his wife was admitted to the hospital that night. The day after she got out, my mother was in the ER for dehydration. There were several times when I wondered, “Are they going to die too?” I cannot begin to fully exemplify how terribly stressful all of this was to our family. As my dad said, “This has been the worst two weeks of my life!” So to say it was a flurry of activity would be an understatement. Yet, the Lord continued to infuse me with strength. I would do what needed to be done, but then I had to allow myself to release the grief and stresses of the day through tears each evening. If I didn’t, I was a basket case the next day. There is such cleansing and emotional release in letting those tears fall. Through this experience, I have learned that even tears are part of God’s mercy to us because of how much better we can feel after a long cry. Another was I experienced God’s mercy was in the message of mercy He spoke to me. You see – I used to teach Sunday school every Sunday. That isn’t possible now since I work every other weekend. Yet, teaching God’s word is still a passion in my soul. He gave me a clear, concise message on His mercy to share at the memorial service. He knew this would do two things: 1. Give me a mission in my pain, which would be a comfort to me. 2. Allow me to use the spiritual gift He gave me to comfort and encourage others as we all walked through this valley of grief together. As you face your own struggles in this life, I challenge you to look for God’s mercy and see how He demonstrates it to you in new, unexpected places. Eat, sleep, work, and pay bills….That is a phrase my husband will often recite when it feels like we are doing the same thing over and over. However, there are times when “life happens,” and in that moment, you know your life will never be the same. We had one of those moments on March 14. I was working the switchboard, looking forward to going home and having the weekend off work, when I got the call that changed our lives. My cousin called to tell me my brother had died unexpectedly, just one day before his 53rd birthday. He called because he didn’t want to deliver that kind of news over the phone to my parents. I quickly left work, sobbing all the way home, praying for the Lord to help me. After all, no child should EVER have to deliver that kind of news to their parents. Parents are supposed to die before their children – not the other way around. Having to deliver that news was the worst thing I have ever had to do. My weekend off work became a whirlwind of activity. My brother lived in Arizona, so we had to drop my parents off at the airport the next day so they could be there to help my sister-in-law with the arrangements. Two days after his passing, I dropped my daughter off for youth group. As I left the parking lot, I was playing a CD by Shannon Wexelberg. The song “Faithful God” came on. The Lord immediately began to speak to my aching heart. I want to share what He spoke so tenderly to me in hopes that it will help you when “Life Happens” to you. We will all go through different, heart-wrenching trials during our journey on earth. Whether it is the gut-wrenching loss of a loved one, the herculean burden of finding yourself without a job, the formidable news that you or a loved one has a debilitating illness, or even the shock of receiving divorce papers, God’s mercy is there for you. 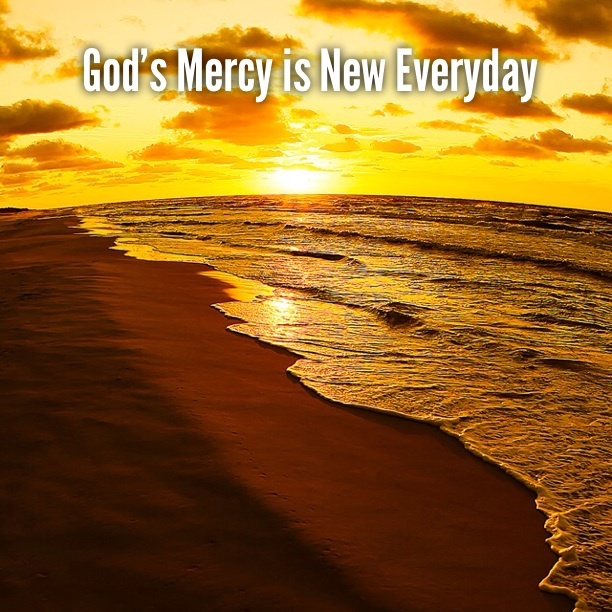 His mercy is new EVERY morning. This means that the mercy He gave you yesterday won’t be the same today. It will be different, but it will also be new. And it will be just what you need. To those of you who are dealing with the painful reality of losing a child, I will tell you the same words the Lord had me speak to my parents at my brother’s memorial service. His mercy will be there each and every day. That compassionate mercy will greet you as you face all of the “firsts” – the first Mother’s Day, the first Father’s Day, the first birthday, the first Thanksgiving, and even the first Christmas. He lovingly cares for you, and He will not let you walk the valley of grief by yourself. Reach out, take His hand, and let Him extend His mercy to carry you through.